CELLINK is strengthening its position as the leading bioink and bioprinting company in the industry. Today CELLINK launches the BIO X Inkjet printhead – a product developed specifically for the purpose of enhancing the bioprinting users experience, allowing researcher around the world to further push the limits of science, and to take their research to the next level. The CELLINK BIO X system supports multiple dispensing technologies that adapt to your unique needs. Our BIO X customers have so far had access to the pneumatic-based and mechanical-based extrusion printheads, such as the Heated Pneumatic, Temperature Controlled and Syringe Pump for bioprinting of bioinks and cells or printing of scaffolds with thermoplastic materials, utilizing the Thermoplastic printhead. Today, we are proud to introduce our latest addition to the family of BIO X printheads, the Inkjet printhead. 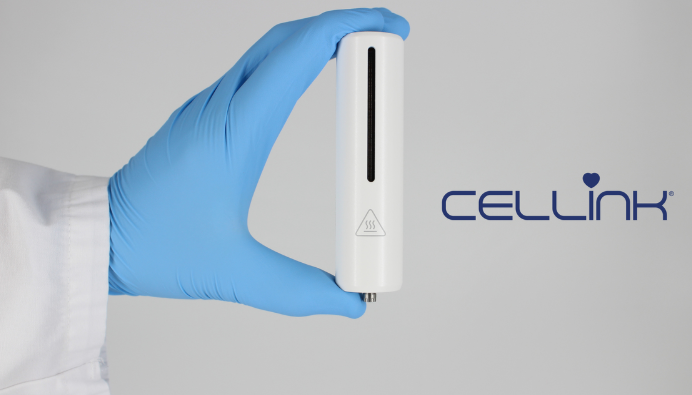 The CELLINK Inkjet printhead is based on electromagnetic jetting technology for accurate contact-less and contact dispensing (drop-on-demand). The print head is ideal for dispensing of low- and high-viscosity bioinks, hydrogels and even cell culturing media. The Inkjet printhead comes with all the accessories needed to support both modes of dispensing, non-contact and contact. The flow rate and drop volume is controlled by adjusting the pneumatic pressure at the bioink source, the microvalve’s opening time (down to 400µs) and cycle time with frequency up to 2,500 Hz. The ink jet print head can also control the temperature of the bioink from room temperature up to 149°F/65°C.